This second issue of "Health E-Bytes" is intended to not only discuss potential modalities of future bioterrorism attacks, but also to reiterate the enormous benefit that optimally dosed intravenous and oral vitamin C would offer such infected or poisoned individuals. I have already had individuals ask me how they could get intravenous vitamin C for themselves and their families in the event of a sudden toxin and/or infectious exposure. The answer at this point in time, unfortunately, is that it would be difficult for many to get treated in this fashion and impossible for everyone to get treated in this fashion. That is why I am making the effort to publish this newsletter. Wonderful information that never gets widely disseminated is of little or no substantive value for the general population. With these thoughts in mind, then, I urge all readers of this newsletter to forward it not only to friends, but also to as many members of the professional health community as possible. Even though 95 out of 100 doctors might just chuckle when they read these newsletters, perhaps the other 5 will be open-minded enough to seriously and scientifically evaluate what is being said. 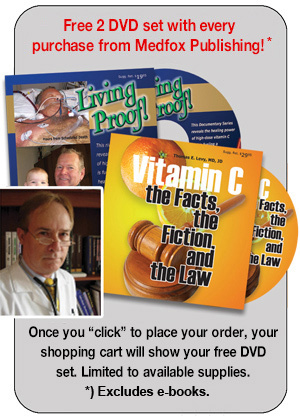 Any doctor who examines the original literature citations on the information that I am presenting can only conclude that vitamin C is as amazing as I say it is, or they can conclude that many different clinicians and primary researchers are simply lying in order to accumulate scientific publications for their resumes. If even one doctor eventually realizes the practical impact of this information and starts treating patients with critical infectious diseases with proper doses of vitamin C, a very significant impact will eventually be made on many patients. One practicing physician impacts the health and lives of many people. And what does Dr. Levy get from all of this? For my more cynical readers, I may eventually sell a few more of my books, and I may eventually get more readers to visit my website and other linked websites. However, my primary purpose is to get long-overlooked and long-ignored information its proper recognition. I want to see sick patients in need of treatment get the best treatment available. That's all. A few more potential bioweapons will now be discussed. There are actually very many more bioweapons than these that could end up being used, but the following three agents have been considered prime candidates for bioterrorists for some time now. These agents, plague, tularemia, and botulinum toxin, will be separately discussed and analyzed. Human plague is caused by a type of bacteria known as Yersinia pestis. Humans usually contract this disease when bitten by plague-infected fleas. It has been noted in the past that epidemics of this disease in humans were often preceded by the death of large numbers of rats, further forcing fleas to leave their preferred rodent hosts and seek out humans (Inglesby et al., 2000). Clinically, plague can present in three different forms: bubonic, septicemic, and pneumonic. Most naturally occurring cases are bubonic. This form of infection has an incubation period of 2 to 6 days. The clinical onset of symptoms is characteristically abrupt, with a sudden onset of headache, muscle and joint aches, fever, and chills. Often only hours later, swollen, tender lymph nodes will appear in the neck, armpit, and groin areas, indicating a rapid progression of the disease through the body. These swollen lymph nodes are known as buboes, giving rise to the name bubonic. When this form of the plague goes untreated, more than 50% of those infected will die. Septicemic plague is almost uniformly fatal when left untreated. This form of plague involves a large amount of infection in the bloodstream. Bubonic plague can sometimes lead to septicemic or even pneumonic plague. Those patients who progress rapidly to a septicemic form of plague probably have weaker or more compromised immune systems, which facilitates the rapid spread of the disease in the blood. Pneumonic plague, somewhat like inhalation anthrax, requires early and aggressive treatment to avert a fatal outcome. Furthermore, unlike bubonic or even septicemic plague patients, pneumonic plague is readily catagious (Ratsitorahina et al., 2000). If used in the future as a bioweapon, the plague will not be spread by large numbers of infected fleas. Rather, the spread would be most probably achieved by inhalation of an aerosol form of Y. pestis microorganisms, which would result immediately in a large number of people getting the pneumonic form of the plague. Furthermore, this would greatly accelerate the transmission of the disease among susceptible populations of people, in contrast to the amount of transmission that would occur if the plague infection presented in the bubonic form. Early diagnosis would be critically important for the survival of individuals exposed to an inhalation form of plague. Until the first case was confirmed in the laboratory, patients would be considered to have gotten a very aggressive form of pneumonia. Broad spectrum antibiotic therapy would save some if instituted soon enough. The antibiotics that have been most effective in treating the plague include streptomycin, gentamicin, doxycycline, tetracycline, and chloramphenicol. The antibiotics commonly used for infection prevention after known exposure are tetracycline, doxycycline, and trimethoprim-sulfamethoxazole (Conn's Current Therapy 2001). A vaccine is no longer available for the plague. Furthermore, the vaccine that had been developed only showed benefit against the bubonic form of plague. It did not appear to prevent or lessen the consequences of the pneumonic form of plague (Speck and Wolochow, 1957). For the same reasons discussed in the first issue of "Health E-Bytes," vitamin C would be an excellent adjunct therapy for the plague. Both oral and intravenous administrations of vitamin C would result in a significant bolstering of the immune system. While a high enough dose of vitamin C could logically be completely effective as a monotherapy treatment for the plague, there is certainly no reason not to take both the appropriate antibiotics along with the vitamin C. Furthermore, since no specific reference could be found in the literature on vitamin C and plague, it would be inappropriate to try to treat the plague with only vitamin C, even though it's effect on other bacterial diseases would predict a high likelihood of complete clinical success in the treatment of plague. Tularemia is a disease caused by a type of bacteria known as Francisella tularensis. Although not one of the potential bioweapons that is familiar to many people, the transmissibility of tularemia could make it especially effective as a bioweapon. F. tularensis is one of the most infectious of disease-causing bacteria, and the inhalation of as few as 10 organisms has been known to cause disease (Saslaw et al., 1961). The inhalation form of tularemia, which would be the type of tularemia likely seen in a bioterrorist attack, tends to present abruptly, with fever, chills, body aches, runny nose, and sore throat. Cough with chest discomfort and other signs of pneumonia can then appear (Pullen and Stuart, 1945). Left untreated, one third or more of patients with pneumonic tularemia can be expected to die (Stuart and Pullen, 1945). Properly treated, however, less than 2% of patients should die (Evans et al., 1985). Vaccination for tularemia is presently not advised except for laboratory personnel who are routinely working with F. tularensis bacteria (Dennis et al., 2001). A wide variety of antibiotics are available to effectively treat this disease at this time. However, laboratory manipulation has been demonstrated to produce strains of tularemic bacteria that are resistant to some of the commonly used antibiotics (Overholt et al., 1961; Pavlov et al., 1996). This raises the unsettling possibility that tularemic bacteria prepared specifically for biowarfare may not be as readily killed with antibiotics as the bacteria found in the naturally occurring disease. To be sure, take all recommended antibiotics for any tularemic infection, but don't neglect to add the vitamin C as previously discussed. In reviewing the scientific literature, I could find no cases of infectious disease that were shown to be initially susceptible to vitamin C, only to later develop a resistance to vitamin C. This development of resistant strains of bacteria appears to occur only when man-made antimicrobial drugs are used for a long enough period of time. Botulinum toxin should probably result in more fear and anxiety over its possible use as a bioweapon than just about any other agent. This is because it is extremely potent and capable of killing easily. Furthermore, it is a refined toxin; there is no infection to be attacked. Botulinum toxin is presently considered to be the most poisonous substance known (Gill, 1982). Although it would be very difficult to accomplish technically, there is enough potency in one gram of botulinum toxin to kill over one million people if properly dispersed (Arnon et al., 2001). Botulinum toxin is produced by the metabolism of the bacterial species known as Clostridium botulinum. Although only a very small dose of this toxin can be fatal when swallowed, a roughly 100-fold smaller dose can be expected to be fatal if inhaled. The symptoms of botulism are those of a progressive paralysis starting in the muscles of head and neck, proceeding eventually to weakness of the other muscles in the body, including the arms and legs. Death results from respiratory insufficiency from either the relaxation of the throat musculature blocking air entry into the lungs, or from inadequate air movement by the weakened respiratory muscles surrounding and supporting the chest cavity. The treatment of botulism, aside from supportive care, involves an antitoxin that immunologically neutralizes the botulinum toxin. However, an early clinical diagnosis and prompt treatment are essential to save the exposed patient. Vitamin C is just as useful for the treatment of a pure toxin as it is for the treatment of an infectious disease. Jahan et al. (1984) and Dey (1966) both showed that vitamin C could effectively neutralize tetanus toxin. Tetanus toxin is also produced by a Clostridium species of bacteria, like botulinum toxin. Klenner (1974) reported curing a four year-old receiving a "full strike" from a highly poisonous moccasin snake. Klenner (1957) also reported the complete clinical neutralization of the toxin associated with a black widow spider bite. Calabrese (1985) reported on the effects of vitamin C on a group of 24 pesticides, heavy metals, hydrocarbons, and gaseous pollutants, noting that vitamin C reduced the toxicity of the vast majority of these agents. It should also be noted that these were predominantly diverse, rather than similar, agents. Vitamin C has also been seen to neutralize the toxicity of a number of different bacterial toxins produced in the anaerobic environment of deep dental infections. When tested against specific critical enzymes, many of these toxins were substantially more toxic than botulinum toxin. Nevertheless, patients who were clinically ill from the effects of this group of toxins invariably showed dramatic improvement from the infusion of enough vitamin C.
Regardless of the mechanism, which is probably not singular in nature anyway, vitamin C should be the agent of choice for all acute poisonings. In many cases, the ascorbate ion in vitamin C directly neutralizes the toxin. In other cases, the vitamin C improves immune function enough to help negate the toxic effect through immune mechanisms. Remember that an acute infusion of vitamin C is virtually harmless. Klenner typically started a vitamin C infusion in his office on all of his sick patients even before he made a diagnosis. He never hurt anyone with this practice, and he helped very many. In any case of suspected poisoning, start high-dose intravenous vitamin C with vigorous hydration immediately, and then proceed with a diagnostic workup so that specific antibiotics and/or specific antitoxin therapies can later be added to the treatment. In an acutely poisoned and/or infected patient, there is no good reason not to proceed with the vitamin C infusion immediately, as all poisonings and infections rapidly metabolize what vitamin C is present in the body, making an acutely-induced scurvy-like state part of the clinical presentation. Any scurvy-like state requires vitamin C to be resolved, and such a state will make any existing infection or toxic medical condition worse and more difficult to treat effectively. Arnon, S., R. Schechter, T. Inglesby, D. Henderson, J. Bartlett, M. Ascher, E. Eitzen, A. Fine, J. Hauer, M. Layton, S. Lillibridge, M. Osterholm, T. O'Toole, G. Parker, T. Perl, P. Russell, D. Swerdlow, and K. Tonat. (2001) Botulinum toxin as a biological weapon. Medical and public health management. The Journal of the American Medical Association 285(8):1059-1070. Conn's Current Therapy 2001. (2001) Edited by Rakel, R. and E. Bope, Philadelphia, PA: W.B. Saunders Company. Dennis, D., T. Inglesby, D. Henderson, J. Bartlett, M. Ascher, E. Eitzen, A. Fine, A. Friedlander, J. Hauer, M. Layton, S. Lillibridge, J. McDade, M. Osterholm, T. O'Toole, G. Parker, T. Perl, P. Russell, and K. Tonat. (2001) Tularemia as a biological weapon. Medical and public health management. The Journal of the American Medical Association 285(21):2763-2773. Dey, P. (1966) Efficacy of vitamin C in counteracting tetanus toxicity. Naturwissenschaften 53(12):310. Evans, M., D. Gregory, W. Schaffner, and Z. McGee. (1985) Tularemia: a 30-year experience with 88 cases. Medicine 64(4):251-269. Gill, M. (1982) Bacterial toxins: a table of lethal amounts. Microbiological Reviews 46(1):86-94. Inglesby, T., D. Dennis, D. Henderson, J. Bartlett, M. Ascher, E. Eitzen, A. Fine, A. Friedlander, J. Hauer, J. Koerner, M. Layton, J. McDade, M. Osterholm, T. O'Toole, G. Parker, T. Perl, P. Russell, M. Schoch-Spana, and K. Tonat. (2000) Plague as a biological weapon. Medical and public health management. The Journal of the American Medical Association 283(17):2281-2290. Jahan, K., K. Ahmad, and M. Ali. (1984) Effect of ascorbic acid in the treatment of tetanus. Bangladesh Medical Research Council Bulletin 10(1):24-28. Klenner, F. (1957) The black widow spider: case history. Tri-State Medical Journal pp. 15-18. Overholt, E., W. Tigertt, P. Kadull, et al. (1961) An analysis of forty-two cases of laboratory-acquired tularemia. The American Journal of Medicine 30:785-806. Pavlov, V., A. Mokrievich, and K. Volkovoy. (1996) Cryptic plasmid pFNL10 from rancisella novicida-like F6168: the base of plasmid vectors for Francisella tularensis. FEMS Immunology and Medical Microbiology 13(3):253-256. Pullen, R. and B. Stuart. (1945) Tularemia: analysis of 225 cases. The Journal of the American Medical Association 129:495-500. Ratsitorahina, M., S. Chanteau, L. Rahalison, L. Ratsifasoamanana, and P. Boisier. (2000) Epidemiological and diagnostic aspects of the outbreak of pneumonic plague in Madagascar. Lancet 355(9198):111-113. Saslaw, S., H. Eigelsbach, J. Prior, H. Wilson, and S. Carhart. (1961) Tularemia vaccine study. II. Respiratory challenge. Archives of Internal Medicine 107:134-146. Speck, R. and H. Wolochow. (1957) Studies on the experimental epidemiology of respiratory infections: experimental pneumonic plague in Macaccus rhesus. The Journal of Infectious Diseases 100:58-69. Stuart, B. and R. Pullen. (1945) Tularemic pneumonia: review of American literature and report of 15 additional cases. The American Journal of the Medical Sciences 210:223-236. Copyright © 2001 by Thomas E. Levy, M.D., J.D.